Today I received the following email saying; “Your mailbox is almost full”. It certainly got my attention, I do receive a lot of emails. Beware, however, this is a spam/phishing email. You DO NOT want to click that link. The “here” link points to “http://goguscerrahisi.com.tr/a” – which is definitely NOT a Microsoft link. Microsoft’s emails usually have a footer with their company and contact information. 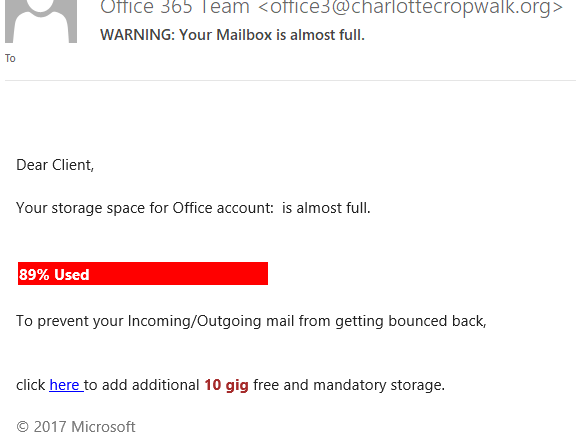 In fact, unless you are using Office 365 Microsoft has no idea if your mailbox is almost full. They know nothing about your mailbox storage space. Go to your email provider and confirm the amount of storage space your mailbox is using. You may need to go to the control panel for your account, or call their support line. 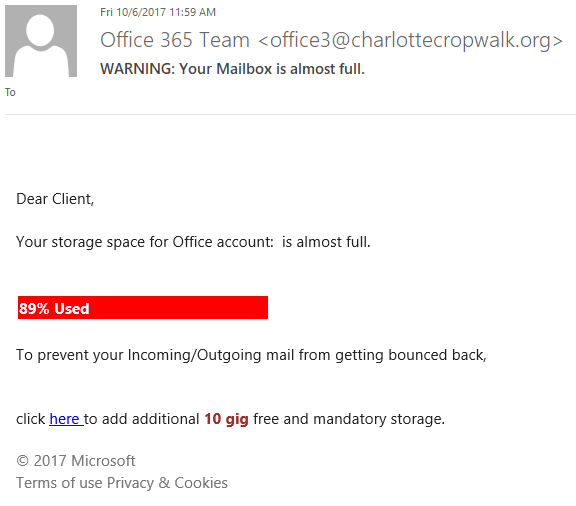 If you use Office 365 you can click File, in Outlook and you will see your amount of storage space on the right under Mailbox Settings. As a rule, don’t click links in emails from senders your don’t know. Place the mouse cursor over the link and see where it goes. Be the first to comment on "Your mailbox is almost full – Spam"